CALSPA all natural solar sea salts are the perfect balance between quality and value. 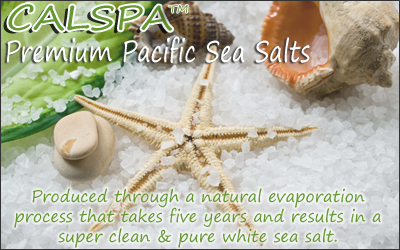 CALSPA Pacific Sea Salts are made through the ancient and natural process of slowly evaporating Pacific Sea water to collect its salt - A process that takes five years from start to finish and produces a crystal white sea salt. These premium quality CALSPA Pacific Sea Salts contain no known allergens, and exhibit virtually no microbiological activity. CALSPA sea salt is comparable to Mediterranean sea salt and is virtually identical in look, feel, and composition breakdown. CALSPA are ideal for making natural bath salts, body scrubs, and a variety of other bath and body related products. CALSPA natural sea salt has become a standard ingredient used by many companies in the bath, body, and spa industry. Exceptionally cost effective, quality solar sea salts from the Pacific Ocean. Benefits: For general muscle relaxing, and to soothe aches and pains. Grain Sizes: Extra Fine (0-0.5mm), Fine (0-1mm size), Medium (1-3mm size). Scent: Unscented - this product is natural sea salt. - Bath Salt - Add 4oz - 8oz per bath for a soothing & relaxing soak. For true muscle and skin therapy, try using 1lbs or more for a real sea therapy experience. - Exfoliating Body Scrub - Choose extra-fine or fine grain and mix with natural oils to create a natural salt scrub. Popular oils are almond oil, grapeseed oil, sesame oil, and avocado oil. You can also add in a few drops of your favorite essential oils or scent. Ingredients: Natural Pacific Sea Salt.